The teaching takes place on the Whitechapel campus of the medical school. 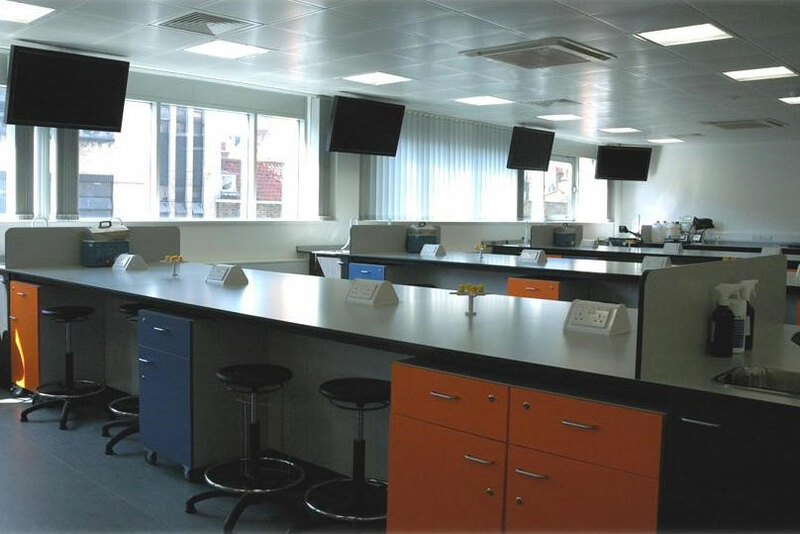 At the heart of the Whitechapel campus is the Blizard Building, which houses state of the art facilities for students and staff: open-plan research laboratories, office space, a 400-seat lecture theatre, a café and several seminar rooms. The course is offered with both part time and full time study options. To study this course as a part-time student, you must be employed in a suitable laboratory within the NHS, PHE or the private sector and your employer will need to support your application, to be able to give you time to study and provide a suitable project. The taught element of the course is provided one day a week and you will also be expected to undertake additional private study. In your first year of study you will attend on Tuesdays and in your second year, your day of attendance will be Thursdays. Undertaking the course full-time is most appropriate for overseas students. Full-time students are attached to the Centre for Immunobiology within the Blizard Institute (please note this is not a clinical attachment). Full-time students study for 12 months and will be expected to be able to attend teaching sessions at the University Monday to Friday. In addition to the Tuesday and Thursday teaching shared with part-time students, there are tutorials, research and clinical meetings on other days. To enable the full-time students to participate fully in discussions about laboratory techniques and clinical cases with their part-time colleagues who are attending by day-release, additional tuition is provided in the formative studies module, during the attachment to the Centre for Immunobiology. The additional tuition provides further hands-on practical experience using material designed to reflect the clinical samples and laboratory procedures in a routine hospital laboratory. The students are encouraged to complete the practical work as individuals to gain maximum experience, but discussion within the group and with the tutor is encouraged. Applicants for the MSc Clinical Microbiology must have a MBBS or basic medical degree from a university recognised by the General Medical Council (GMC). Applicants with a minimum of a 2:1 degree in nursing or pharmacy (depending on the modules studied at undergraduate level) or equivalent, may also be considered for a place on the course. If you are unable to find the information you require, please contact the Admissions Office for assistance or the MSc Course Administrator: pgmicro-admin@qmul.ac.uk. As students at Queen Mary, you will be expected to play an active part in your acquisition of skills and knowledge. A variety of teaching and learning methods will be employed in the MSc programme, including: seminars, laboratory practice sessions, self-directed learning, tutorials, case presentations, all supported by reading lists and journal papers. Students are assigned a personal mentor who will guide them in both academic and pastoral matters throughout their time at Queen Mary. For every hour spent in classes, students will be expected to complete further hours of independent study. The individual study time could be spent preparing for, or following up on, formal study sessions, reading, producing written work, completing projects, and revising for examinations. The MSc modules are assessed using a combination of final written examinations and a series of in-course assessments. The in-course assessments consist of literature reviews, oral and poster presentations, practical and written exams. They are designed as a learning experience as well as a test of knowledge. The Research Project assessment is based on a 15,000 word written dissertation, and an oral presentation. I am currently lecturing year 4 pre-clinical medical students, biomedical students, and give tutorials to Infectious Diseases Postgraduate student doctors. I'm now the Microbiology representative on the National Epidemic Preparedness and Prevention Committee (NEPPC) at the Ministry of Health (MOH), the Infection Prevention (IP) hospital committee, and the hospital Drug and Therapeutic committee. I head the World Health Organisation (WHO) supported Paediatric Bacterial Meningitis (PBM) surveillance to help in evidence based policy decisions such as introduction and review of vaccines in children under the age of 5 years. The MSc training has helped me play an active role in providing guidance in clinical laboratory diagnosis and been a vital link between the laboratory and clinicians in interpretation of results to aid in appropriate antibiotic therapy. The training has given me confidence in my work and helped give meaningful contributions in diagnosis and therapy of infectious diseases, infection prevention, as well as academics." Lectures were taught by experts from top universities, members of national committees and leading researchers, and we had tutorials and extra assignments to ensure we were keeping up, along with additional practicals to recap the week's sessions. Practicals were well run and I found, lots of fun. We were given plates and lead through the microscopy and secondary testing of the pathogens, taught to distinguish between species or had to match the case information to the pathogens. These were followed by discussions where we benefited from the knowledge of our more experienced peers.